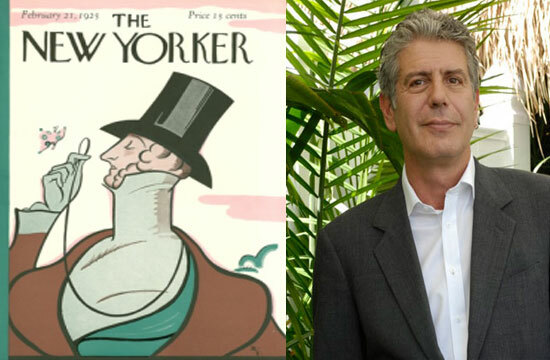 More than a decade ago, New Yorker editor-in-chief David Remnick elevated little-known chef Anthony Bourdain out of obscurity by publishing the infamous “Never Eat Fish On A Monday” essay (reprinted in The Guardian). Now, either with great irony or with sheer terror at the Bourdain-ified, macho food world, The New Yorker published an article today tearing him down. I like eating pig parts and cow organs and eels, [but] it has taken the overweening performer Anthony Bourdain to turn my good, plain meals into a demonstration of virility. For him, there is no quiet meal of tripe grated with cheese. One cannot eat in peace: in the land of Bourdain, no dinner is complete without stentorian grunting, cursing, and beating one’s chest. …I read recently that these days “Bourdain shies away from the bad-boy image that he crafted for himself. He just likes talking about being a dad.” But he can’t swagger out that easily. He’s left a crude hickey on this country’s food culture. A lot of otherwise reasonable aspiring cooks have looked to Bourdain for guidance, and he has responded by burping in their general direction. We’ll be cleaning up his mess for years to come. Though the entire piece is a thoughtful, often stinging response to Bourdain’s man-brand, Adler tends to be vague on the details of his real effect on the food world. Instead, she focuses on his entire public persona and very little on the “aspiring cooks” who idolize the man, which, given Bourdain’s public discomfort with his fans’ self-destructive behaviors, would have completely solidified her criticism. To dislike my sentences is a perfectly reasonable position. To find them hyperbolic, badly written, crude or offensive also seems reasonable. But to accuse me of attempted “manliness” is beyond the pale. I fail to see how the eating of meat or tripes or bones has any gender association–and am baffled by this ham-fisted attempt to suggest that I do. I have never seen the enjoyment of food as competitive–or aggressive–or as an indicator of virility. If anything, the opposite is true.